The Vedas say we are all spiritual beings—eternal, blissful, full of knowledge—and so is God. The difference is God is infinite and we are not. In this world, everyone mistakenly thinks their temporary body is their real self. 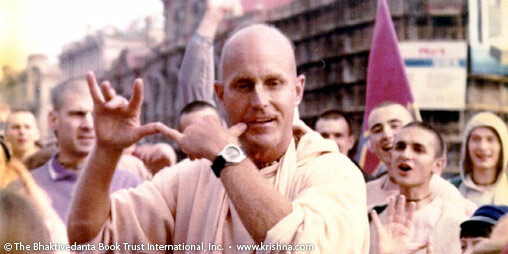 We belong in the spiritual world with God (one of Whose names is Krishna, "the All-attractive one"). But until our pure love for Him awakens—and we no longer want to try to enjoy separately from Him—we must stay in the material world. The reactions to our activities, or karma, force us to take repeated births in various species. Our life is perfect once we find a teacher, or guru, who can show us how to purify our consciousness and reestablish our love and service attitude for God. The easiest (and most highly recommended) method of self-purification is to chant the holy names of God—the Hare Krishna mantra—in the company of like-minded spiritual seekers, or devotees of Krishna.